Midleton CBS will now face Presentation Athenry at the last four stage. A LAST-GASP goal from Jason Hankard rescued victory for Dr Harty Cup champions Midleton CBS this afternoon in Nowlan Park and saw them advance to the semi-finals of the Croke Cup as they accounted for Dublin’s Coláiste Eoin. Midleton looked primed to advance at their ease as they led by five points at the three quarter mark but a stirring Coláiste Eoin comeback saw them take the lead in injury time. However, the final word belonged to the Harty Cup winners as Ryan McCarthy’s sideline ball was deflected to the net by Hankard to complete a thrilling victory in the 6th minute of added time. 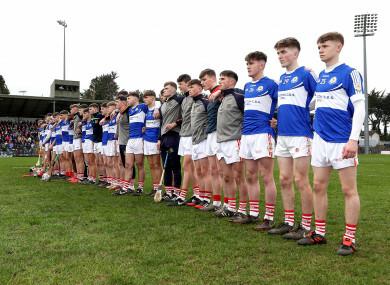 There was very little to separate the sides in the opening quarter as Hankard and Ross O’Regan were both on target for Midleton while Pádraig Puirséil and Dónal Mac Duinnsléibhe replied in kind for Coláiste Eoin. However, McCarthy’s prowess ensured his side a narrow but deserved 0-8 to 0-6 interval lead and he continued to dominate upon the resumption as he landed four scores on the bounce to leave Midleton in control at 0-12 to 0-7 by the 45th minue. However, their opponents battled back gamely with three points of their own and when Ó Luanacháin landed a point from deep in the 63rd minute to augment a goal by Seamus Ó Fiachna, they looked well set for victory. However, there was to be one final sting in the tail as Hankard completed a memorable win for his side in the most thrilling of circumstances. Scorers for Midleton CBS: Ryan McCarthy 0-10 (0-6f, 0-2 sideline, 0-1 ‘65’), Jason Hankard 1-1, Ross O’Regan 0-2, Sam Quirke 0-1. Scorers for Coláiste Eoin: Séamus Ó Fiachna 1-3 (0-2f), Pádhraic Ó Luineacháin 0-4 (0-2 ‘65’), Dónal Mac Duinnsléibhe 0-2, Darach Mac Giolla Bhríde, Pádraig Puirséil, Odhrán Mac Gearailt 0-1 each. Email “Dr Harty Cup champions fall behind in injury-time, then hit winning goal and reach All-Ireland semi-final ”. Feedback on “Dr Harty Cup champions fall behind in injury-time, then hit winning goal and reach All-Ireland semi-final ”.